"The most memorable part of our cycling trip was definitely discovering the seaside town of Carrapateira. Staying with such friendly hosts and sleeping at night with the sound of crashing waves was just beautiful. The quiet, remote location was very special. " "We had a very happy and enjoyable On-Track holiday cycling in the Alentejo. We oldies found the route moderately challenging but it gave us rewarding insights into a corner of Portugal that most people don't know. The accommodation was good, varied, and interesting. The bicycles were excellent. Bert Smeman had planned the holiday well, and his reliable, thoughtful, and helpful support contributed significantly to our holiday's success. We liked all the places where we stayed, but especially liked breakfast in the courtyard at Anna's in Mértola and our very comfortable and spacious room in Serpa". Cycling through orange groves in the sunshine and stopping to feast on big juicy oranges! Fabulous downhill sections rewarding the effort of dragging our bikes to the top. Fantastic scents from the forests of warm eucalyptus will always remind us of Portugal. Also some outstanding fresh fish was eaten on this holiday. Yes we stayed in small hotels and ate in small local restaurants and didn't contribute to pollution or traffic. The range of beautiful places that you visit - cycling through gorgeous countryside with orange trees all along the way, stunning beaches, pretty villages, interesting towns and bright blue skies every day. Make sure that you wear padded shorts!!! It certainly felt like it - we never got in a car and used local shops and markets to buy food for lunch and ate in local restaurants. The holiday was fantastic in every way - Bert gives personal service all the way, the route details were faultless and the accommodation was always either very good or sometimes stunning. He even sends information about the towns and hotels to you in advance of the trip so that you can look forward to it even more. It is good value for money and good to feel that it was a personal affair. We enjoyed the riding through the hills and the extra trip out to the lighthouse and westernmost part of Portugal. Terrific! Make sure you arrive in time in Monchique (to enjoy the spa); get away early each day to spend some time in each town to look around. Yes. We stayed all at small, local places and took our own clothes which eliminated the driving of our bags around. Excellent. It was well planned out by Bert; the bikes were in good shape and drove well; the hotels were perfect; and he even arranged great weather :-). From the first time we met Bert to get fitted for our bikes, it was clear how passionate he is about sharing his love of cycling in Portugal. The bikes were well maintained and he made certain that we had everything we needed for a safe and enjoyable journey. The best part of the trip was following Bert's route maps through the beautiful Portugal countryside. We had a chance to explore areas we would never have found on our own! We found the Portuguese people to be warm and engaging. We loved the fresh seafood!! We wished that we had read more about the rich history of Portugal. We also wished we had learned more conversational Portuguese! I think that the areas in Southern Portugal where we traveled were a great combination of small inland hill towns and all that you would expect from more tourist geared coastal retreats such as Lagos. We enjoyed exploring Lisbon before taking the train to begin our bike holiday. All of the accommodations selected by Bert were small and locally owned. The proprietors were anxious to share their knowledge and enthusiasm about the people and places in proximity to our lodging. Wonderful trip in all aspects! There is no one moment that stands out - it was all so well organised. The routes, well planned, the scenery beautiful, the accommodation excellent. Ensure you are willing and fit to cycle the whole route - though not horribly challenging there are definitely a few hilly sections! Absolutely. Local accommodation, services and restaurants were used. 10 out of 10. Bert was incredibly detailed, set up a great cycling route, gave great, detailed advice regarding accommodation, each area we visited, restaurants and was efficient and friendly in dealing with all enquiries. The trip was a pure and delightful adventure - The route was challenging in places and yet it was balanced overall and allowed us to spend time not only on the bikes (no more than 4 h-5 hours a day depending upon that section of the route) but it also gave us ample time in the towns we got to visit. Ours was a self guided tour so Kudos on the directions - they were great and with all the little side roads and various turns they were written so that even if you went the wrong way you knew it within 2 km or less - which obviously can save a lot of time and energy. We never got lost. Hotels were great - they were above average -- they had great pools and the staffs were very accommodating. The attention to those details as well as the equipment provided, support available if something happened , was very much appreciated and better than what we had experienced with other tours in the past. Review the towns you will be going through and make sure you target some of the "off path" points of interest or a beach you want to swim at as the distance between towns is not that great thus giving you the time for side trips. Brush up on the local cuisine --it’s great as long as you know what to order. If you take the trip that ends in Lagos get Bert to book you at least one more day there-Beaches are great --Town has a lot to offer and it’s a great place to wind down in. Even 2 days would not be out of the question. Go to Sagres --you will have the opportunity to do it as you will be staying over at one hotel for 2 nights -See the fort where Henry the Navigator taught all the early Portugal explorers navigation and which is located on the most SW portion of Europe -- about 50Km roundtrip -- fairly easy ride and well worth it. Final tip --If you can start early in the morning especially in mid to later July. It can get hot once the sun comes over the mountains --but an early morning start not only gives you that cool morning air , but a very limited traffic flow if any and the chance to explore or enjoy the beach during the heat of the day and not having to be out on the road. We were on bicycles so there was no impact on the environment in our opinion and we contributed to the local economy of each cafe and village we visited not only financially but interacted with the people who were wonderful. Cycling through beautiful countryside with the roads to ourselves. Arriving on the west coast for dramatic scenery, crashing waves and relaxed hanging out. Enjoy the scenery around you. The distances are just right and it doesn't take too long to get from one place to the next. There is plenty of time for swimming, relaxing, exploring and eating! It's a good mix. The accommodation and places we ate in all were owned by local people, so all money spent went back into the local community. We had a brilliant time. It's amazing how hungry you get cycling! We ate some really really good food - lots of seafood and drank very good wine the whole week. The Portuguese Countryside is breathtaking and the scenery from a bike was wonderful. It was such a privilege to see this side of the country.... of the beaten track and generally unseen by the tourist. Absolutely loved the challenge of riding each day in the hills. So exhilarating, made you feel glad to be alive. Perhaps only to be sure that you have enough food and water with you. This kind of bike riding uses lots of fuel. Also try and have some idea of where your actual accommodation is ...... at the end of the ride you can feel very tired and trying to find you digs can make you feel a little fraught after a long days ride. Regular stops for refreshment are a must! Perhaps, cycling is kind on the environment and we did benefit the local people in that we were still spending money on the journey. That was not really the main issue. We love cycling and wanted to spend time doing that and taking advantage of new experiences and changing scenery. Fantastic. We did not know what to expect and how things would work, but it was a totally wonderful experience. We were given maps and instructions which helped us arrive at each destination. Our luggage was collected and delivered for us. Each Bed and Breakfast was very comfortable and the breakfasts were everything we could want.. Very well organised and we absolutely loved everything about the holiday. Would definitely do this kind of thing again! What we found most memorable was the sense of history to be found in the ancient, cobblestoned, fortified old towns. So much of the tour was through beautiful, pastoral countryside, with cork trees, olive groves, wild flowers and sweet-smelling citrus blossoms. The roads chosen were mostly quiet, scenic and well-paved, with the occasional hill - OK, maybe there was more than the occasional hill. We enjoyed the diversity in accommodations, which were all very good to excellent. One of our very favorites was 'Bamboo', in a tiny West Coast beach community, just outside the town of Carrapateira. It was a learning experience to see how Portugal is so much more advanced in terms of energy conservation than North America. Although this operator lists standard tours, we found than Bert was willing to work with us to create a customized tour, based on his standard tours, extensive knowledge of cycling and the countryside of Southern Portugal. We found Bert very easy and pleasant to work with, both by e-mail and in person. Our tour was in the spring, after the March rains, but before the summer heat. It was the perfect time to avoid the crowds. Consider the relative cycling abilities of your group. If some cyclists are faster than others, it would be a good idea to request individual daily route instructions. We stayed in small hotels or B&B's, and ate in local restaurants, so yes, we believe that our presence benefited the local people. We elected to carry our own gear, thus eliminating the need for shuttling of our bags each day. We feel that this makes bicycle touring more environmentally friendly, but it does reduce the taxi operators' and drivers' incomes. It is also our thought that the more intimate contact afforded by self-propelled travel benefits both travelers and local people. Sadly, the biggest impact on the environment is the international air travel, and carbon offsets should be seriously considered. It was delightful and very successful. We would certainly recommend this tour operator to friends, without hesitation. The entire trip was beyond all of our expectations! It is difficult to pinpoint just one part, from the remote and beautiful little villages in the mountains to the rugged and breathtaking west coast and then finally to the busy town of Lagos with all of its great history, wonderful marina (great shopping) and beautiful beaches, it is truly hard to believe you can see so much in such a short amount of time. The bikes themselves were excellent. The accomodations were superb, Bert has taken so much time and effort to personalize this holiday, that it makes this a truly exciting adventure. This is very important to me: Never once did I feel unsafe in any of the places we visited. Thanks Bert!! Good Job!! If you are looking for an active and laid-back kind of holiday and like smaller more personal accomodations a little 'off-the-beaten-path' kind of thing then this would definitely be a good choice. Ladies, leave your makeup and high heels at home! Pack your bag and then take out at least half of the stuff - you won't need it. We had several conversations with the local people in the places we visited, they were usually interested in where we came from and how our way of life may differ from theirs, (Canada vs Portugal) I think we learned a lot both ways! We ate everday in small local cafes and the food is always home cooked, very delicious! One of the best ideas I've ever had!! It is evident that Bert is very concerned with the safety, well being, and satisfaction of his clients. I would highly recommend this holiday. Without a doubt, our time at Carrapateira on the west coast - the beautiful, peaceful natural environment, vast empty beaches, dramatic sea and also our lovely accommodation there with Isabel, who couldn't have been more helpful and friendly. The round trip recommended by Bert for the second day at Carrapateira was well worth doing, probably the best ride of the week. If you prefer leisurely cycling and have the time, consider spending an extra day or two to give time for the beach/exploration/rest. We found Lagos a cultural shock - it seemed very touristy after the quiet places we'd been in before. If you're not into tourist resorts, Salema may be a better option for the last night. Cycling is obviously the most environmentally friendly way to travel (although the luggage was being transported by car... but then if we'd had to carry it all on the bikes, I don't think I'd have chosen this holiday!) Hotels were locally owned, not big chains. We were using local shops and cafes away from the main tourist areas and out of the main season, so that would benefit local people. Superb. Bert's organisation made everything work smoothly. You would certainly not find such thoughtfulness and individual attention in a larger outfit. The cycling was a joy: well-researched routes on mostly quiet roads with little traffic but good surfaces, not too hilly, not too flat, and with the accurate and detailed notes provided, you couldn't really go wrong. The bikes were excellent and it was reassuring being able to rely on Bert should there be any problems. It was very relaxing being able to go at our own pace, stop for photos, food, drink or rest when we felt like it - something you can't do so easily in an organised group. The accommodation was of a high standard with mostly good and generous breakfasts - perfect for cycling energy! Eating barbecued sardines with new potatoes and salad at an unsophisticated cafe miles from anywhere as the waitress told us that the potatoes and lettuce had come from her garden. 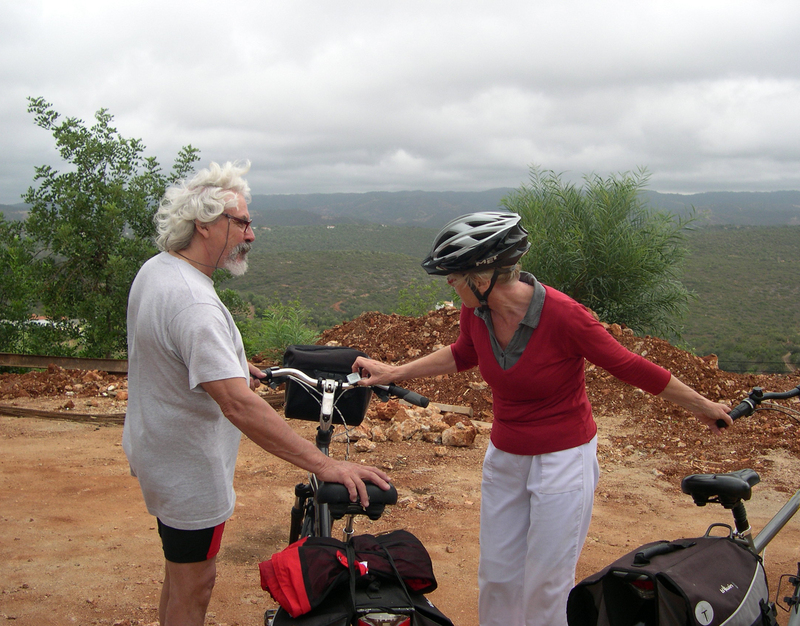 Do not be deterred by the thought of cycling in the foothills of Monchique. The bikes are good and with a little preparation and a willingness to walk a few short stretches even 73-year olds will enjoy it. Seek Bert's advice on where to eat; have the snails at Ponte Roma in Silves. Buy your port in England. The food was all local and so was most of the wine because, despite my best endeavours, very little Port was available. Most of the nights were spent in quintas and not hotels and these were very hospitable and comfortable. The local individual who stole my bike benefited substantially but this was balanced by the loss to Bert. I was unaffected. A very low energy holiday. One of the best holidays I have been on. The scenery - the peaceful Monchique hills and the wild beaches of the West coast, different but both beautiful and exciting. The fantastic descents on the bike going down almost traffic free roads at times. The excellent back up from the tour director, Bert Smeman. 'Bamboo' accommodation at Carrapateira stands out as our favourite place to stay, not just the fantastic location but the warmth of our host Isobel. Book with this company, Bert Smeman, the owner of the company ensures the holiday was tailored to the individuals' needs and worry free. The tour that we were on - a basic level of fitness definite advantage. Remember to buy water and fruit/snack before you start each day, then you can stop whenever suits you for a break. Absolutely. We stayed in small hotels at times, spent money in local shops/restuarants and obviously cycling has minimal impact on the environment. Excellent, the bikes were first class, I developed minor problem with mine and at the next stop Bert was there to meet me with new bike! The routes were excellent, directions were detailed and easy to follow so no fear of getting lost, and the people we met along the way were great. Virtually every mile of the carefully chosen, completely safe Algarve biking route offered scenic pleasure - from countless orange, lemon and olive groves early in the week, to mountain vistas and dramatic seacoast rides later in the week, with brilliant spring flowers lining every mile each day. We personally found our two days in and around Carrapateira on the Atlantic Coast to be the single most thrilling and satisfying part of the trip. We trained for about six weeks prior to the bike trip, with a few hilly weekend rides of up to 30 miles. I think that extra effort paid off in our enjoyment of the trip, since we didn't find the hills more than we could handle. 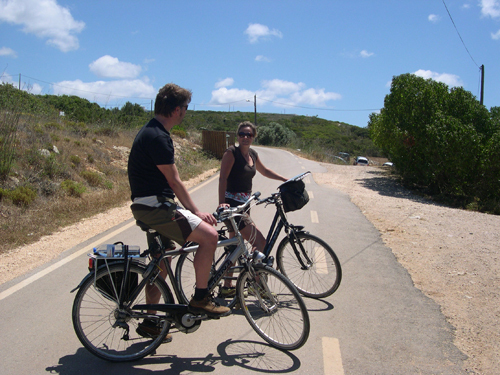 The temperatures in the Algarve in late April - based on our experience - are ideal for biking. There is no way to have less impact on the environment than by biking. I'm sure we did benefit local people, perhaps even more so in the springtime, when the tourist season was not yet in full swing. The support we received from Bert was exceptional. He simply could not have been a better host on our first - but I hope not last - trip to Portugal. Every aspect of this self-guided bike trip exceeded our expectations, and we've been on three prior bike tours in France and Italy. The care that went into planning each mile of the route was extraordinary. I'd really rate this holiday above four stars - I just shied away from your term "reborn". Cycling from Carrapateira to Lagos, beautiful beaches and orange trees. The holiday was great - the organization of the biking was impeccable, and the lodging was well chosen and very pleasant. The best part was travelling beautiful scenic roads with essentially no traffic. As for tips, I will only say that early November is a great time to bike in southern Portugal. No crowds, and perfect temperatures for being on a bike. However, take good rain gear - there are several stretches with absolutely no protection from getting very wet! I think using only bread as fuel is environmentally friendly, and staying and eating in small establishments is both rewarding and good business for the locals. I give this 4.5 stars for anyone who likes to bike - and if you don't you should! The route that Bert had chosen for us was wonderful. We rode our bikes through Olive groves, orange groves, down dirt roads and through small towns and bigger towns. The variety was wonderful. Go for it! Bert is really well organized and the trip is really well laid out. The directions are spot on and he has wonderful accommodations lined up. I would say it benefited the local people because we ate at local restaurants and we stayed at local Bed and breakfast establishments. On a scale of one to ten I'd say eleven. cycled about 3-4 hours each day at a leisurely pace. light, and plenty of gears to make the hills a breeze! efficient service that ensured the holiday went well. impact on the environment, compared to other types of transport. We bought food and drinks from village shops and bars which would have been a small help to the local economies. again. Thank you to Bert for making it so easy and stress free! My partner asks me this question everyday of our vacations together. It’s difficult to narrow it down to one thing. I will say that seeing the Portuguese countryside on bicycle was a definite highlight. Bring your clothes and camera and just enjoy the scenery, the food and culture. Our tour went off without a "hitch"! Certainly. we traveled from town to town by bike. Out luggage traveled by taxi. We did very little to contribute to pollution or traffic congestion. Excellent. bikes perfect, directions easy to understand. Hotel and restaurant suggests selected with care. Thanks! Just being alone with my husband, experiencing life on a bicycle. Free to roam and explore on our own time without having any worries concerning our night's lodging. No time constraints at all. Learn a little of the language. You really travel some back roads which is absolutely wonderful, exhilarating and breathtaking, but each person understands directions differently, so it did help us immensely to be able to converse with the locals. Of course, we left nothing behind and our travel dollars benefited the little local businesses which had to help the economy. Wonderful! We would do it all over again. We have taken such wonderful memories and pictures and we will continue to travel with these in our minds throughout the rest of our lives. We had the most fabulous weather. The first place we stayed, Quinta dos Valedos, was a really great start to the holiday, as Marie-Jose and Sergei are French Portuguese, and introduced us to many culinary specialities of the region, including carob and arbutus berry schnapps! It was right in the heart of the Algarve countryside, very unspoilt, and had a lovely pool. We also enjoyed the personal touch from Bert, the 'tour operator' and the wonderful views from our hotel bedrooms on other nights. Our trips to the coast were also memorable, as they visited smaller, more out of the way places. There are hills, but the bikes are well geared, and neither of us had to get off! If you are susceptible to being bitten, don't forget to bring your anti midge cream and use the mosquito nets at night! The second trip to the coast is the one to take your beach wear to - there is a lovely peaceful bay in a little harbour where the water is shallow, and should be warmer than the ocean. There is also a wonderful beach further on, with beach bars for refreshments. If you are in Silves on Thursday, there is Fado music at a cafe on the river front, or at the weekend you might be lucky to find other live music at the Cafe Ingles. For the first 2 nights, all the produce was home made and most ingredients locally sourced, and we felt this was very beneficial for the local economy. The hotels had dual flush loos, although the one at Alte was not working properly. Some places didn't have waste bin liners, so less plastic. We were able to eat out in the town at Silves and chose local dishes. Being able to breathe the fresh air and feel the sunshine on our skin as we cycled through the countryside, through small villages, along the coastline, and up into the hills. Peace and quiet, and feeling like the holiday added to our health, rather than just sitting around eating too much as people so often do on holiday. Being able to relax and cruise along at our own pace was lovely. We cycled together as a family - with a seven year old and an 18 month old both joining us, sitting on seats on the backs of our bikes. We are not "fitness freaks" but found the cycling pleasant and fairly easy. Bert helped us avoid the hardest section by driving us uphill on the third day, which was a great idea, as it looked like a very long climb otherwise! Bring lots of sunscreen, as the sky is always blue. Remember that the shops/restaurants will likely be closed between lunch and 7pm, and on Sundays it may be hard to find anywhere to stop and eat. Take snacks with you if you have children, and lots of water. Yes. We stayed in mostly small, local places, and we cycled everywhere, so no fossil fuels burned! Excellent. Bert was fabulous, and very helpful. We had great information provided before we arrived, with frequent updates as to what was happening with the planning of the trip. When we got there, we were picked up and taken to our first hotel. Bert had arranged to rent bike seats for our children. The bikes were in great condition, and the routes very clearly described so we never got lost. It was early July so it was very warm but not too hot, and a cooling breeze was blowing most days. The accommodations were excellent - varied and friendly, not impersonal hotel-type places. And very comfortable. The riding was more challenging (i.e. hilly) than the previous cycling holiday we have done (on the Danube in Austria, where there we NO hills), but it was still easy enough to be fun rather than exhausting. Bert was very concerned about our welfare (and the safety of the children) and did all he could to ensure it all ran smoothly, which it did. Each day we only cycled about 30km, which isn't that far. And we stayed in each hotel for 2 nights, meaning we could have taken every 2nd day off from cycling if we were too tired (but we never needed too, even though I hadn't done that much exercise since our baby was born). All in all, we had a great time. We'd recommend this to anyone (either with or without children). As long as you aren't a completely unfit couch-potato, you'll cope fine and you'll really enjoy it - returning feeling refreshed and like you've done your body a favour with this holiday. I would give this 4.5 stars. We travel a LOT so it would be almost impossible to be better than all of our other holidays (which is what is says next to the 5 star rating). But if you're considering this type of holiday, or you want to go to Portugal, then this would be a great choice! I decided to spend a few days over Easter cycling through the Algarve and did so on my own. Bert, the man behind the tour company, did a great job in giving me honest advice and counsel over the phone and was a reassuring presence. The price when booking as a single is slightly higher than normal (hotel and bed & breakfast places being geared towards double occupancy), the instructions handed out were very reassuring and clear and I did not get lost despite my bad sense of orientation. The social life in the evening was rather calm (do not expect anything organised) but perfectly friendly and nice. I had a great time and feel in better shape, and the smell of orange blossom is still in my nose. Take light walking shoes, e.g. sport's sandals, so you can walk (including pushing the bike) when you do not want to sit on the saddle any longer. Cycling through the Eucalyptus trees in the hills and the citrus fruit groves in the low lands. Also really nice having a day at the coast to get some beach time in! Moving on every day gives a real sense of travelling and getting to see the most possible. Bert (the organiser) was very helpful and accommodating. Oct is a really good time of year to go. The roads are nice and quiet and the temperature is perfect. The smaller local hotels benefited. Very good. Thoroughly good way to see Portugal off the tourist trail. Overall very pleasant and well organised. No particular part stood out. Bert had extra cycling options for experienced cyclists on racer bikes. It is suitable for families, rather easy for people in good physical condition. Most hotels/guest houses good and food very good in general. It fully met our expectations. We will visit Portugal in the future again I’m sure to cycle and see more of the country. Cycling through the orange groves. If coming from UK consider how hot it might be cycling midday. It was hot in October. Benefited the smaller places we stayed at. Enjoyable holiday. The distances were just about right as it gave us time to look at things, take photos etc. We found it hillier than we thought, but just pushed the bikes up the hills. The trip we made was absolutely beyond our expectations, the planning was excellent as well as the smooth day by day cycling experience, the accommodations were simple but very comfortable, clean & with a warm and efficient service. In terms of relation between cost and value we are totally satisfied with what we got. We have recommended this experience to friends and relatives, it's completely worth it time and money wise, although (because of the physical effort) not suitable or likable for everyone. We should point out that our word about this experience has created quite a lot of curiosity & interest. This holiday was different from any we have had in the past, with a pace & rhythm of its own, a remarkable gathering of friends with what we believe is a positive impact on local people and its environment, definitively local people have benefited from this type of tourism. The tips we could give people interested in repeating this experience concerns only the athletic preparation (before the trip) that could make the cycling easier and more enjoyable. We rate our trip a 5 star holiday. We take the opportunity to thank again the warm, well organized and professional intervention by Bert (the guy that was hired to make all the arrangements needed for this wonderful experience to happen). Curiously arriving at the next accommodation place and being served gorgeous food every night. Try to cycle in the morning on hot days. Two of the four accommodation places were with locals and in one of the hotels we had tickets for food in local restaurants. Lunch was not included and taken en route. Very good. A 30 km a day mostly easy cycle ride and lots of relaxing at the pool with a good book. Bert transported our luggage and wrote us a little note regularly. He and our hosts told us lots about the country and its people. The trip was wonderful even though we made it as difficult as possible for Mr. Smeeman to organize the tour by giving him almost no time (about a week) to do it and choosing the height of the tourist season in the Algarve. The accommodations were very good, the bicycles absolutely top drawer and the daily descriptions and route guides were very accurate. We didn't miss a turnoff, country lane or a signpost. Mr. Smeman was always on time, personally saw to it that our bags were at the hotels and always had the answers to our questions and an encouraging word. All in all, two very satisfied customers. We're looking forward to our next trip using Responsible Travel.